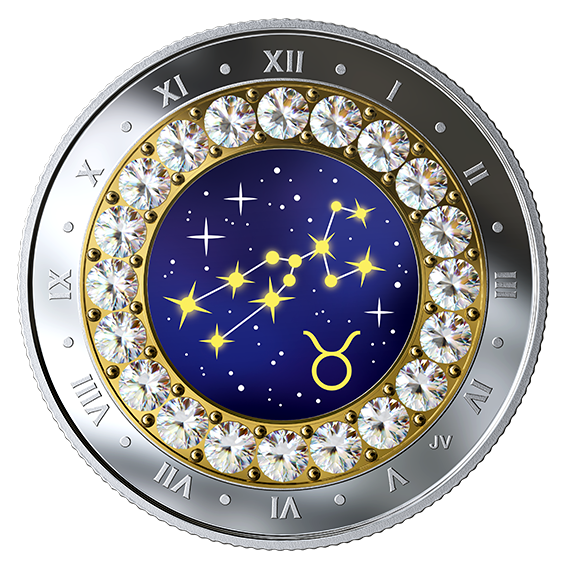 Swarovski® Crystals adorn the reverse of a new zodiac coin from Canada, which highlights the Taurus star sign for those born between 21 April and 20 May. Designed by artist Jori van der Linde, the coin features an engraved outer ring of Roman numerals to give the appearance of a classic timepiece. An inner ring of Swarovski® crystals surround a dark blue zodiac-themed image, that pairs the constellation and symbol associated with Taurus. The obverse of the coin features the word “CANADA”, the face value “5 DOLLARS”, the year “2019” and the effigy of Her Majesty Queen Elizabeth II by Susanna Blunt. People born under the Taurus sign are said to be hard workers with the utmost commitment to seeing their tasks through to the very end. They have an eye for beauty and an appreciation for the finer things in life, but above all else, they value their loved ones. Taurus is the fifth in the twelve-coin series issued by Royal Canadian Mint and is limited to 4,000 coins worldwide. To order the coin, visit the Mint's website.